Gibraltar has the same status as Bermuda, the Falkland Islands etc. : they used to be called Crown Colonies, but are now British Overseas Territories. Gibraltar was never a Dominion; that is an almost term that used to be used in general for independent countries in the Commonwealth that retained the British monarch as Head of State. I think that only Canada has retained that title as such. The Isle of Man has a different constitutional relationship with the UK and is known as a Crown Dependency. Wikipedia says: "Gibraltar's National Day commemorates the 1967 referendum when the people of Gibraltar voted to reject Spanish annexation by a massive majority. It is celebrated annually on September 10. The day is a public holiday, during which most Gibraltarians dress in the national colours of red and white and among other events, attend a rally. The rally culminates with the release of 30,000 red and white balloons representing the people of Gibraltar." See also an old (2002) BBC news story. "An escutcheon on which the upper two thirds shall be a white field and on the said field set a red castle, and below the said castle, on the other third of the escutcheon, which must be a red field in which there must be a white line between the castle and the said red field, there shall be a golden key which hangs by a chain from the said castle, as are here figured." Gibraltar has a banner which shows the arms of the colony and is used as the colony's flag. The flag is white with a red stripe at the bottom with a three-towered, two-tiered red castle in the white section. Each tower has a door and a window and from the door of the middle tower hangs a gold key which mainly overlaps the red stripe. According to notes by William Crampton, this flag was officially introduced in 1966, but had been in traditional use "for as long as anyone could remember". It was formally established on the 8 November 1982 "for internal purposes and for continued use abroad, together with the Union Flag, on appropriate occasions when the specific identity of Gibraltar is being represented". Beforehand, the flag of Gibraltar was the blue ensign of the colony. I think we may safely assume that the current simplified castle as shown on the official model (that is with no stonework and upright walls) was based upon that of the Civil Ensign, which was in part firmly rooted in the grant of 1502. The officially recommended shade of red for all British flags is 186C, and I would suggest that this should be followed for Gibraltar. For the flags of UK Dependent Territories, I would suggest the British recommended shades of red and blue - red PMS 186C and blue PMS 280C - there are no recommendations for the arms. 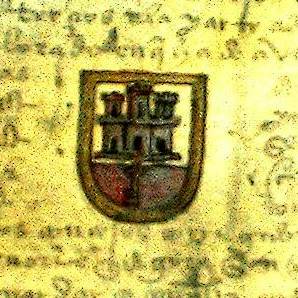 Arms consisting of a triple-towered castle with a golden key in the centre were granted to "The Most Loyal City of Gibraltar" by Ferdinand and Isabella in the year 1502. The original grant on vellum is now in the archives of the Municipality of San Roque. The words usually found underneath the arms are "Montis Insignia Calpe", meaning "Badge of the Rock of Gibraltar", the same words that appear on the Colours of the Suffolk Regiment, which obtained permission to have the Arms of Gibraltar inscribed on their colours, in recognition of the gallant part they played in the Siege of Gibraltar. The words "Nulli Expugnabilis Hosti" meaning "Conquered By No Enemy" also occasionally appear under the Arms of Gibraltar. In 1875, a copy of an Admiralty Flag Book was forwarded to all colonies with an enquiry as to whether the devices shown in the centre of the flags were correct. It was stated in the same despatch that in those colours where badges for flags had been approved, no objection would be offered to their continued use, but it was hoped that the first opportunity would be taken of adopting the device on the seal. The reply to this despatch was to the effect that the badge for the Union Jack shown in the flag book was correct, but that it differed from the device on the seal of the colony and that the earliest opportunity of adopting the latter device would be taken. The origin of the device on the Seal of the Colony, which consists of a picture of the Rock with a sailing ship in the foreground and the words "Nulli Expugnabilis Hosti" underneath, cannot be traced, but it has been suggested that it was taken from a Commemorative Medal of the Siege, believed to have been designed under instructions from General Eliott. No action has been taken with regard to replacing the badge originally approved for the centre of the Union Jack, but the device shown on the Seal and in a despatch in September 1926, the late Sir Charles Monro recommended that the arms originally granted by Ferdinand and Isabella should be regarded as the true and proper Arms of Gibraltar, and that the device on the seal should be changed to conform with this. He also recommended that the words "Montis Insignia Calpe" should be regarded as part of the device. The Secretary of State sought the advice of the Garter King of Arms as to whether the Arms granted by Ferdinand and Isabella could be regarded as the recognised ones without the necessity for a Royal Warrant and whether they could be placed on record officially with the addition of the motto "Montis Insignia Calpe". He was advised that this could be done without the issue of a Royal Warrant and it was suggested that a properly attested and accurate copy of the Grant of Arms in 1502 should be recorded at the College of Arms. According to lags, Badges and Arms of the British Dominions Beyond the Seas and of Territories Under His Majesty's Protection [hms32] (Supplementary page, Volume II), Gibraltar's coat of arms was adopted 10th July 1502. The year, and information that the grant was made by King Ferdinand and Queen Isabella seems to be generally accepted, but I have not seen the day and month quoted anywhere else. [...] we grant you as arms an escutcheon on which two thirds of its upper parts shall have a white field, in the said field set a red castle underneath the said castle, on the under third of the escutcheon which must be a red field on which there must be a white line between the castle and the said red field; on this a golden key which shall be on that with a chain from the said castle. I am of the opinion that Gibraltar like any other territory that evolves to a new political status needs to amend its flag to one that reflects its new status and differentiates it to the past. Since our country is no longer a colony and we have maintained our links with the Crown (UK) (thanks to our new constitution), these sentiments also need to be transposed on our flag because our flag is our advert to the world. Edgar proposes that Gibraltar should have a new flag - why? The current one does not represent or portray any colonial allegiances, so why the need to change it? This is not to criticise the one that he is proposing. Is Edgar suggesting that we should get rid of the Union Jack and instead fly this "new" flag of Gibraltar at the top of the Rock and at all official buildings except at the MOD and the Convent, the Governor's Official residence. I do not think this is likely to be acceptable to the British, unless they want to give credence to the untenable position adopted by those who believe that we have ceased to be a colony. We are still very much a British Colony and our new Constitution reaffirms this status however modern our relationship with Britain. So I believe that the Union Jack is here to stay for a while longer yet. But I do look forward to being proved wrong. Far be it for me to disagree with either Alfred or Edgar but in retrospect I feel both have a point and therefore let me throw out the following. Let us go for one similar to the Australian or New Zealand because truthfully the present one's origin is too close for comfort although judging from remarks of some time ago we have to move fast before we once again get what we don't want. The flag therefore could never have been colonial since it is a development of the coat of arms of the city which were granted when still a Spanish possession. This flag has been OUR flag through the days when we were Spanish and the days when we have been British; in fact, for 500 years. Why should we want to change it? This is not the case of a flag imposed by a colonial power which the people want to change as soon as independence or other enlightened status is achieved; this is a flag we have had through thick and thin, through our sieges and through two World Wars; this is the flag our evacuated forefathers flew in Madeira, Jamaica, London and Northern Ireland. Too much history, blood and tears are attached to this flag. We should not even dare to suggest we change it! Keep our flag flying, keep our Castle and Key for ever! Mr Triay's design is interesting, but the existing flag is just fine. Nevertheless, there might be a case for adopting a new coat of arms, like the one that he features on his proposed design. One model for this might be the cap badge used by the Royal Gibraltar Regiment, which features the Crown, but is otherwise distinct from the British Royal arms. However, the flag should be left alone - it represents Gibraltar unambiguously, and adding British heraldic symbols like crowns, lions and unicorns would detract from this, just as using a Blue or Red Ensign like other overseas territories would do. Our flag is full of meaning, its not just a castle and Key on a red and white backdrop, but a symbol of pride, justice, strength and courage. I agree that our flag be somewhat modernised to reflect what would be our future status, but in keeping with the current design. I suggest that we do not jump the gun, no matter how enticing it might be. We must first, wait for the resolution of the General Assembly on our International Status, which is somewhat unclear at present. Edgar's design is, for me, a contradiction. On the one hand he argues that our alleged decolonisation should result in us having a new flag. On the other he suggests defacing the Castle & Key with a British coat of arms (a very colonial symbol). Our flag as it currently stands is ideal simply because there are no colonial symbols on it. Let's keep it that way. Incidentally our red and white flag is not official. The official flag is the blue ensign with the Gibraltar coat of arms in the fly. Thankfully we never see or use this alternative flag, and the sooner we do away with it and keep our Castle & Key as the only official flag the better. And the sooner we see the Castle & Key flying above the castle and at the top of the Rock the better too...I just don't understand why we insist on flying the Union Jack to the detriment of our own flag from these locations! I beg to differ from Den. The red and white flag IS official. The flag was regularised on November 8, 1982 as the City flag and is formed, as all should know, by two horizontal bands of white (top, double width) and red with a three-towered red castle in the centre of the white band; hanging from the castle gate is a gold key centred in the red band. The flag differs from that of other British colonies, in that it is not a British ensign. The defaced blue and red ensigns are the state and civil ensigns respectively; neither are in use as the flag of the city of Gibraltar.